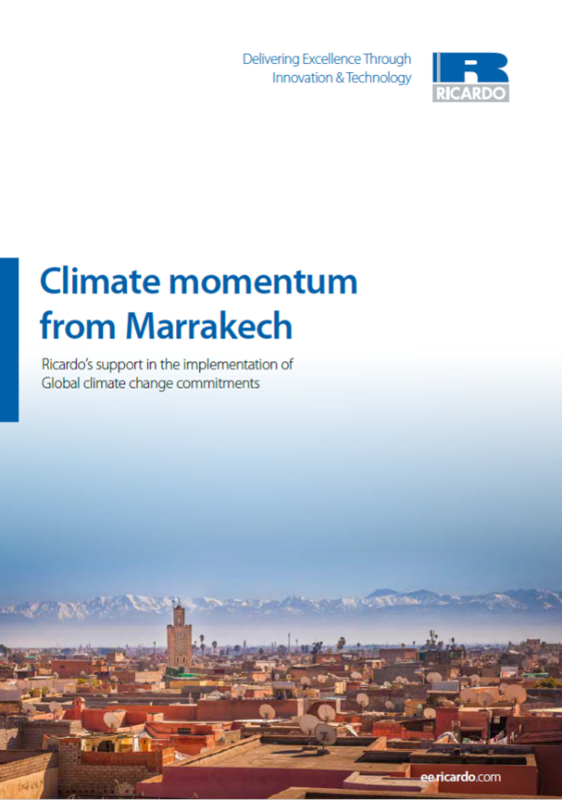 Fresh from their participation in the COP22 summit in Morocco, Ricardo’s top team of environmental specialists is closely involved in helping a wide range of nations to begin putting their agreed climate change mitigation and adaptation measures into practice. There was general euphoria after the 2015 COP21 climate conference in Paris where the world’s nations committed to a programme of greenhouse gas [GHG] and climate adaptation measures to address the worsening impacts of climate change and keep the rise of global temperatures to ‘well below’ 2 degrees Celsius. The most important outcome of Paris was that all these disparate nations and organizations had united on the general direction of travel and were prepared to sign up to legally-binding commitments. Already, 194 nations have signed and 116 parties have ratified the Paris Agreement, representing almost fourfifths of total GHG emissions. As a result, the agreement came into effect on 4 November, less than a year after its text was agreed. But while Paris proved great on ambition and broad principle, it provided little detail on the realities of getting the job done. All knew that the biggest challenge would be the move from brave words to concrete on-the-ground action – and these were the tasks left to the followup conference, COP22, eleven months later in Marrakesh, Morocco. Specialists from Ricardo Energy & Environment played an important role not just in the formal conference proceedings by providing technical advice to country delegations but also in the all-important side events showcasing work done by countries to date. The unexpected speed with which the Paris agreement came into force meant a major shift in focus. Suddenly, theory had to be turned into practice – as Chris Dodwell, director of Ricardo’s climate change and sustainability practice, explains: “The fact that the agreement had come into force earlier than expected meant there was a lot for the COP to get through. The main difference was that the whole agenda was about action, rather than negotiation. So there was a very big focus on what countries were doing about implementation, something that doesn’t really get discussed in the formal negotiating structure. This meant that the side events – the areas in which we [as Ricardo] spend most of our time – were a more vibrant and exciting place than they had been in the past.